Following the just concluded first ever State of the Map conference organized by the OpenStreetMap (OSM) community in Africa, Chad Blevins from the Geo Center at the Global Development Lab, USAID Washington D.C together with 6 Geo Mappers from Uganda, Kenya and Malawi visited the RAN Innovation Lab. During this visit, the team toured the Innovation Lab physically engaging with some innovation project prototypes in the space and engaging with the RAN student interns. This was also an opportunity to share about the RAN internship program, innovations, resilience and Geo Mapping while identifying areas for possible collaboration to enhance knowledge generation and sharing but also service delivery to communities in need. 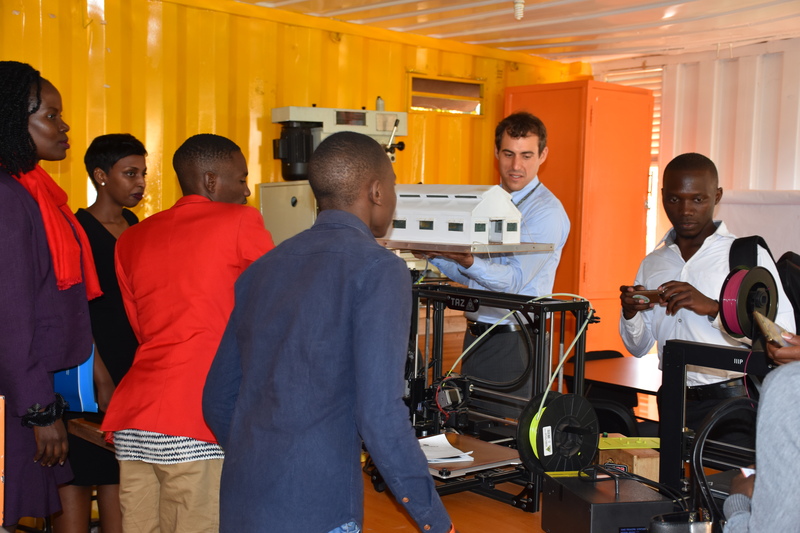 ‘Spent today @AfricaResilient with @youthmappers students, amazing facility prime for geo-research projects’ shared Chad Blevins@geocruizer. In addition, the team had an opportunity to engage with some of the RAN staff sharing in detail RAN’s offer and the need for Geo Mapping in Uganda, Africa and beyond. Dr. Roy William Mayega, RAN Deputy Chief of Party shared about RAN in general highlighting the strength in RAN’s approach building capacity of the youth, students, faculty and the community at large to innovate to address community challenges. In addition, he also spoke to some of the innovative solutions currently under incubation at RAN prominently referring to the Pedal Tap innovation, Community Radio, Arvana, Bacterial Vaginosis Toolkit, Wekebere innovation among others. ‘It is exciting to note that RAN is working towards making use of the big theses finalist students usually publish. These big books are always just left on the library and office shelves and later recycled or even abandoned after a few references are made to the same, it is good that RAN is translating this knowledge into innovative solutions to respond to community challenges, please keep this up’ shared one Geo Mapper from Malawi. Details shared on www.rnlab.org. 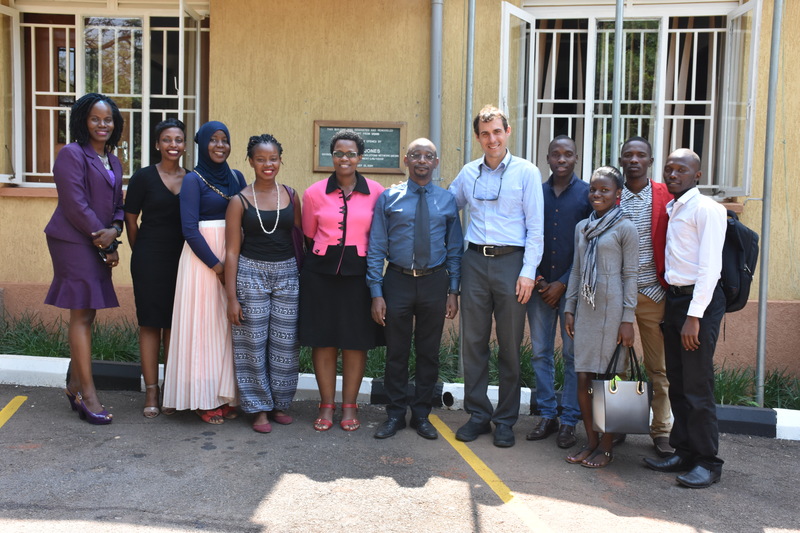 Geo Mappers are already running the Map Uganda Program aimed at mapping all buildings in specific areas, extracting this information and placing it into a GIS hardware to gather knowledge on how many buildings are in a specific area to inform service delivery. Currently, Geo Mapping is in 67 Universities in Africa in 23 countries. 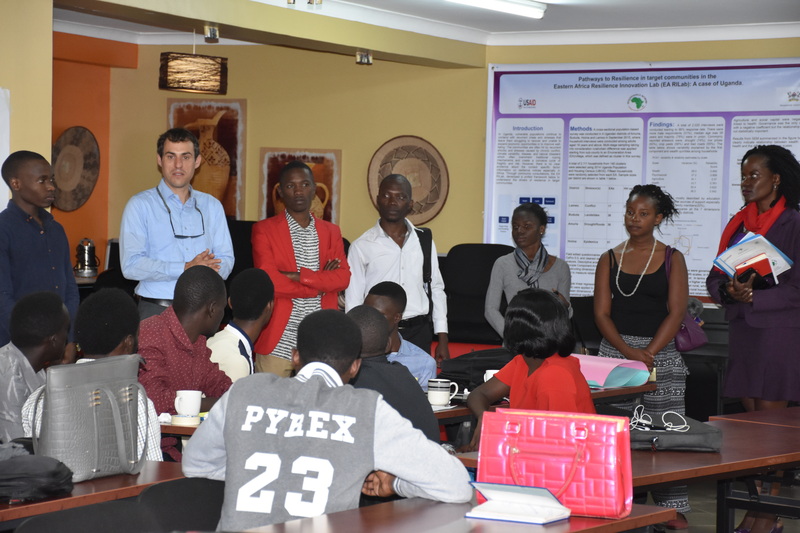 During the discussions, Geo Mappers need to figure out how to further engage with secondary school students and those out of university in order to remain more inclusive. Geo Mapping students also benefit from linkages to mapping experts in different countries, have an opportunity to apply for small grants and leadership opportunities in conferences/workshops. Have some Geo Mappers participate in the RAN Pitch Tuesdays to further share their innovative ideas for critique directed towards further development. Plan to hold a Mapperthon at RAN also in collaboration with the Aid Data Fellows who are currently in Kampala Uganda. Have the Geo Mappers attend and participate in RAN activities including the Social Design Clinics, Innovation Garages, Movie Nights among others. Link Geo Mappers in Kenya and Malawi to the RAN Focal Persons in these countries for learning and partnership possibilities. Open training opportunities for both the RAN innovators and student interns on Geo Mapping but also offer the Human Centered Design Training, and hold an Innovation Co- Creation session among others to some of the Geo Mappers. Use of the RAN Innovation Lab Space for Geo Mapping activities. Moving forward, the teams will start planning to execute some of the activities leading to the implementation of the way forward. It was also agreed that this conversation is kept open and participants endeavor to further leverage from any other opportunities which present. We remain indebted to Maggie Linak, Program Manager, Higher Education Solutions Network (HESN), U.S. 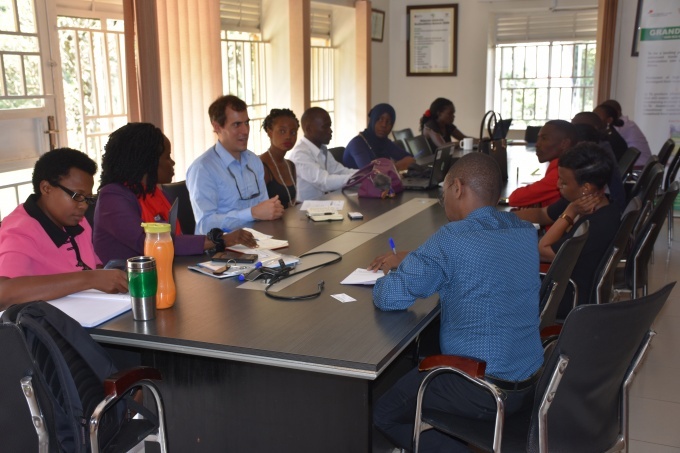 Global Development Lab, USAID and Ticora Jones, Acting Center Director – Center for Development Research, Division Chief – Higher Education Solutions Network U.S. Global Development Lab, USAID Washington, D.C. for the kind initial link and introduction to Chad Blevins and team.